Two trains have been involved in a collision at Darlington railway station. 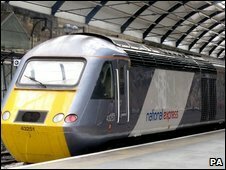 A Northern Rail train hit the back of the National Express East Coast Mainline service from Kings Cross to Edinburgh at platform four. Three passengers on the Northern Rail service were taken to hospital with minor injuries, including whiplash, said a company spokesman. An investigation into the incident has begun, he added. No-one on the National Express train was injured, according to the company. A spokeswoman said: "The impact was minimised as the National Express train had just departed and was already moving out of the north end of the platform." All passengers on the train were transferred to a later service and continued on their journey, she added. The collision caused delays of about 45 minutes to trains on the East Coast Mainline. Services between Newcastle and Berwick-Upon-Tweed and Darlington and Northallerton were also being delayed by up to 20 minutes on Saturday afternoon due to high winds.